France's economy minister says he expects the future chief of Renault to consolidate the French automaker's alliance with Japanese partner Nissan. Bruno Le Maire was alluding to the Renault board's looming selection Thursday of a new president to replace former Renault-Nissan boss Carlos Ghosn, who was jailed in Japan for allegedly falsifying financial reports and under-reporting his compensation. The board is expected to name industrialist Thierry Bollore as CEO and Jean-Dominique Senard of Michelin as chairman. 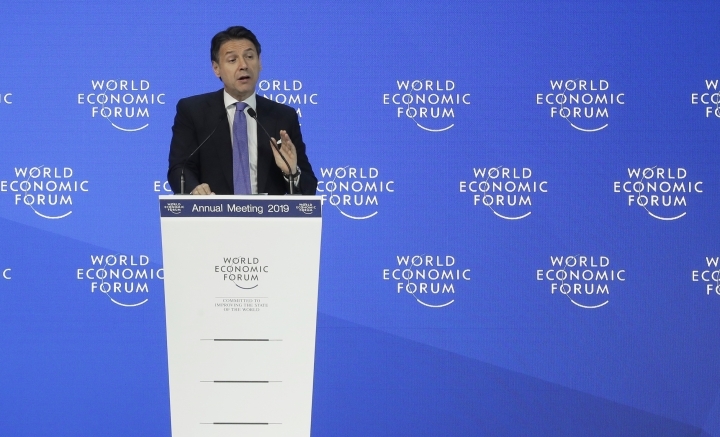 Le Maire told reporters at the World Economic Forum in Davos on Wednesday that choosing a president to consolidate the alliance was the "absolute priority." The French government holds a 15-percent stake in Renault. There aren't many people, if any at all, who spend 32 hours on a train to get to the World Economic Forum in the Swiss ski resort of Davos and then sleep in a tent. 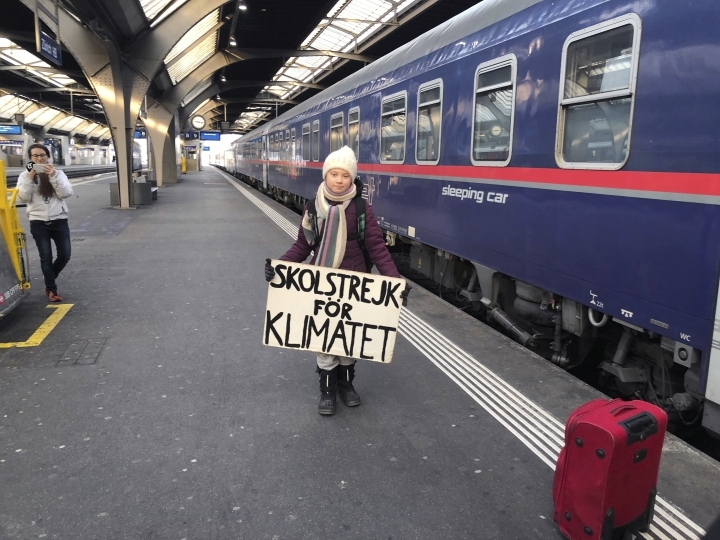 Someone who did is 16-year-old Swedish schoolgirl Greta Thunberg, who was given clearance to miss classes at her Stockholm school to push climate change to the top of the global elites' agenda. 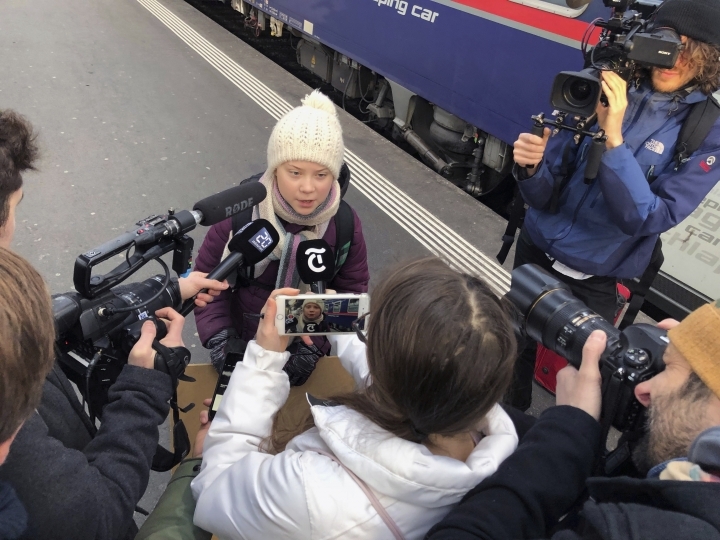 Thunberg has become her generation's voice on climate change after inspiring students around the world to go on strike to relay their anger and angst over global warming. 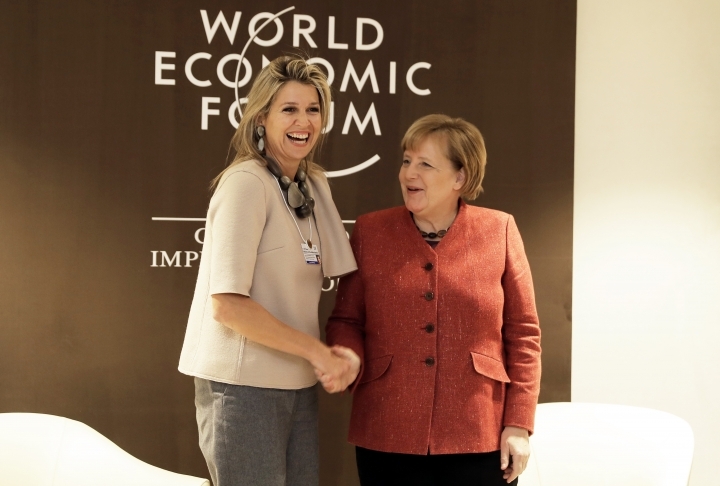 She said Wednesday she is in Davos to "spread the message to people that we are in a crisis and we must take action now." 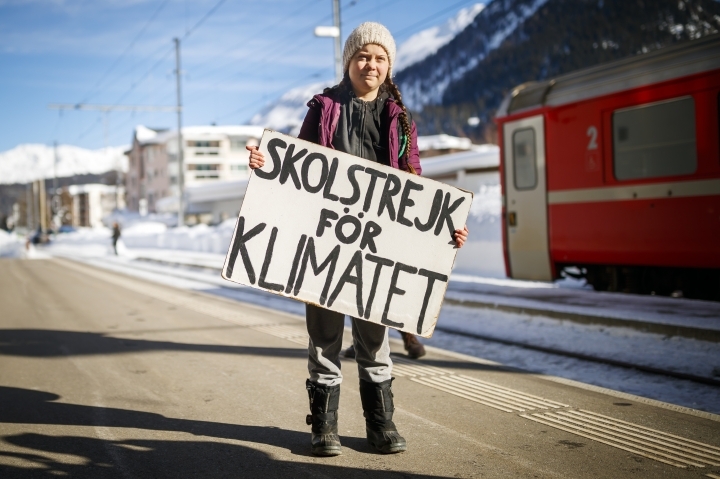 Thunberg lambasted attendees who got to Davos by private jet, saying "I think it's a bit of hypocrisy." The European Union's top economy official says the 27 countries that will remain EU members after Brexit can grant any request by Britain to postpone the breakup only if it comes with some "clarity." Commissioner for Economic and Financial Affairs Pierre Moscovici said on Wednesday the EU needs "some clarity even to give them some time to clarify" Britain's position, but added the "door of each and every member state is certainly open." Britain's departure is set for March 29. Speculation has grown the British government may seek a delay since Parliament rejected Prime Minister Theresa May's Brexit deal with the EU. 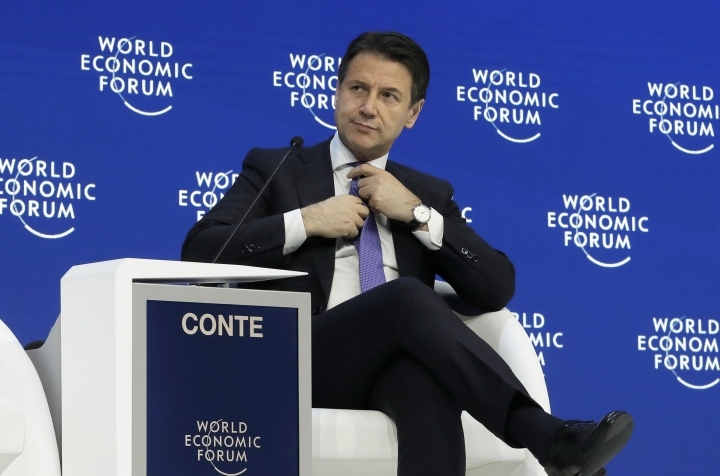 Speaking at the World Economic Forum in Davos, Switzerland, Moscovici said: "You cannot just say 'Well it's the 28th of March. We're not yet there. Give us some time.' You must clarify some options." Moscovici also said it would be "fully legitimate" if Britain held a second referendum on staying in the EU "but it's up to the Brits to decide." Japan's economy and trade minister says his country still sees a lucrative foreign market for nuclear technology and plants despite the recent decision by industrial heavyweight Hitachi to freeze a project in Britain. Hiroshige Seko touted Japanese expertise in a complex sector where a shrinking number of companies have the ability to both design and build nuclear facilities. 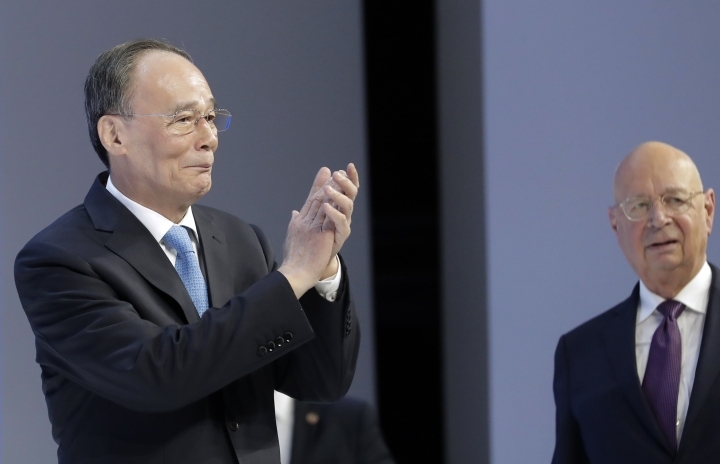 Speaking to reporters at the World Economic Forum in Davos, Switzerland, Seko said his government would encourage and support Japanese companies that are invited to build nuclear facilities abroad. Last week, work on the Horizon Project nuclear power station in Britain was suspended after Hitachi said it couldn't reach a financing deal with the government there. Hitachi executive Chairman Hiroaki Nakanishi noted recent "failures" in construction of power plants that have doused investor interest. Nakanishi said Britain's government was seeking "clear solutions" on nuclear power, and "we are negotiating on how to make it." China's vice president took not-so-veiled shots at President Donald Trump's aggressive trade policies in a speech to global elites at a ski resort in the Swiss Alps. 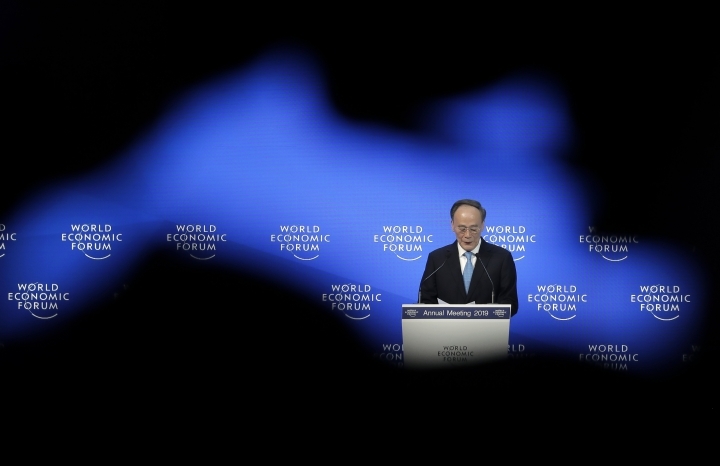 Vice President Wang Qishan said at the World Economic Forum that "Shifting blame for one's own problems onto others will not resolve the problems." The United States and China, the world's two biggest economies, have imposed heavy taxes on each other's imports in a dispute over Beijing's aggressive push to challenge American technological dominance. Wang noted that expanded trade and technological innovations leave many behind. 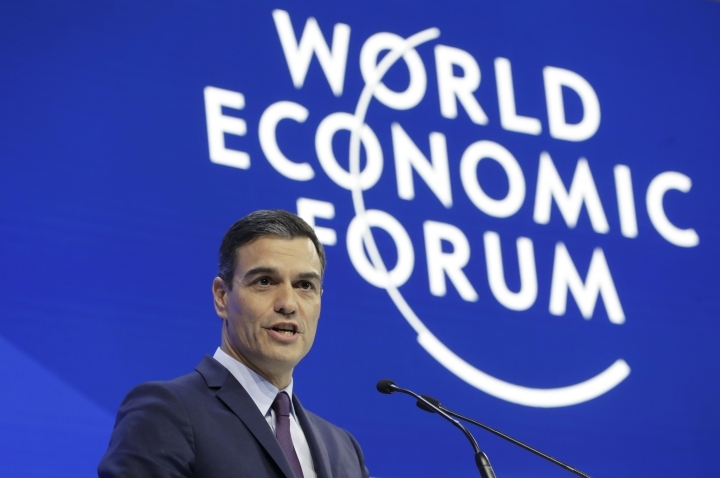 In response, he said in a clear reference to Trump's America, "many countries are increasing looking inward ... barriers to international trade and investment are increasing; and unilateralism, protection and populism are spreading. He added: "What we need to do is make the pie bigger while looking for ways to share it in a more equitable way. The last thing we should do is to stop making the pie and just engage in a futile debate on how to divide it." 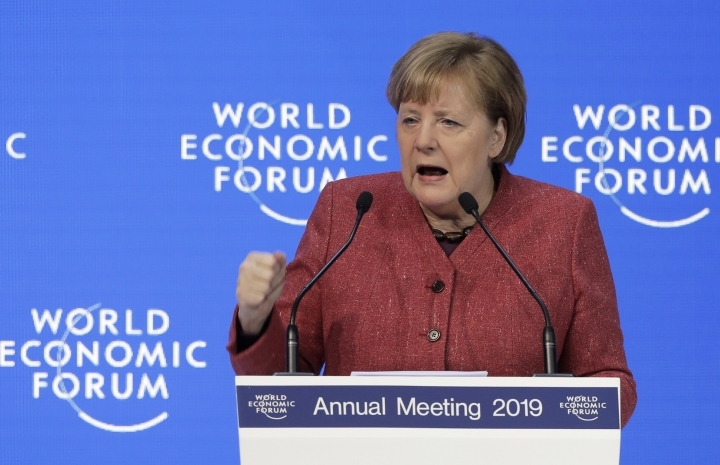 German Chancellor Angela Merkel has made a forceful plea for international cooperation and compromise in an age of populism during her speech at the World Economic Forum in Davos, Switzerland. 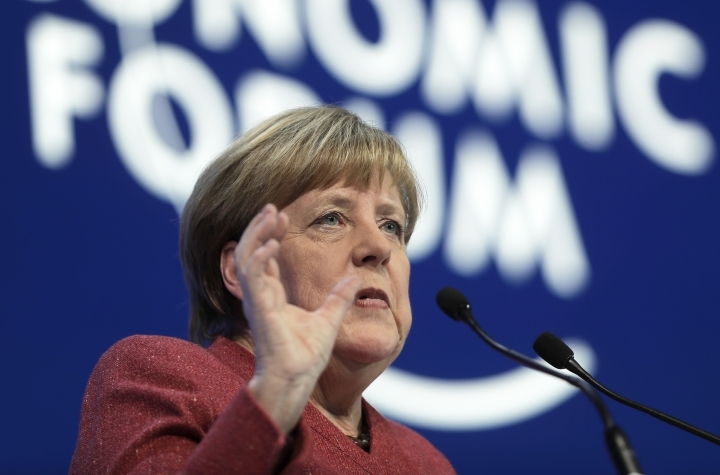 Merkel said Wednesday that leaders need to work against "a fragmentation of the international architecture." These days some think it's best "if everyone thinks only about himself," she said. "I have doubts about that." She said efforts to combat global problems "will only function if we are able to compromise," citing as examples of cooperation the free trade deal between the EU and Japan taking effect Feb. 1. Merkel said Germany was committed to multilateralism starting with strengthening the EU but going beyond that. She acknowledged the "shock" of Britain's planned departure but stressed the need for close and cooperative relations even after Brexit. Ethiopia's reformist prime minister acknowledges that challenges remain "formidable" as the East African power seeks to overhaul its fast-growing economy and open it up to foreign investment. 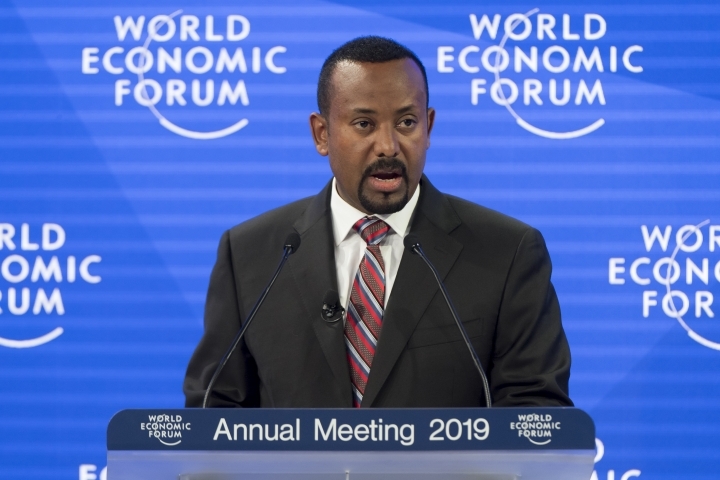 Prime Minister Abiy Ahmed told the World Economic Forum that sustaining growth is crucial in a country with 60 million people under age 24. He says it "requires the unleashing of the private sector" and reforming state-owned enterprises including telecoms, railways and more. He says Ethiopia urgently wants to join the World Trade Organization. He also vowed that the country long controlled by a ruling coalition and allied parties will hold free and fair elections in 2020. Abiy urged investors to "seize the day but also trust the future" in a country that, before he took office in April, was rocked by months of anti-government protests. Ethiopia, he said, had faced the possibility of "state collapse." Be nice. And don't wear a hoody and skulk. That's the way to play poker, says Maria Konnikova, a psychologist, author and now champion in the game. Speaking about her success in the game and its applications to business, Konnikova told delegates at the World Economic Forum that her secret weapon is to take "time to be nice" to those seated around the poker table. Poker, she said, is a "game of small edges" and "if someone decides a few percent less often to take a less aggressive line against me or to target my opponent instead, then I win." Konnikova said she learned more about strategic decision-making from her transition to the world of games than any amount of research in labs. Afghanistan's chief executive, Abdullah Abdullah, urged the world not to give up on his impoverished country, which has struggled with corruption, political instability and a long Taliban insurgency. 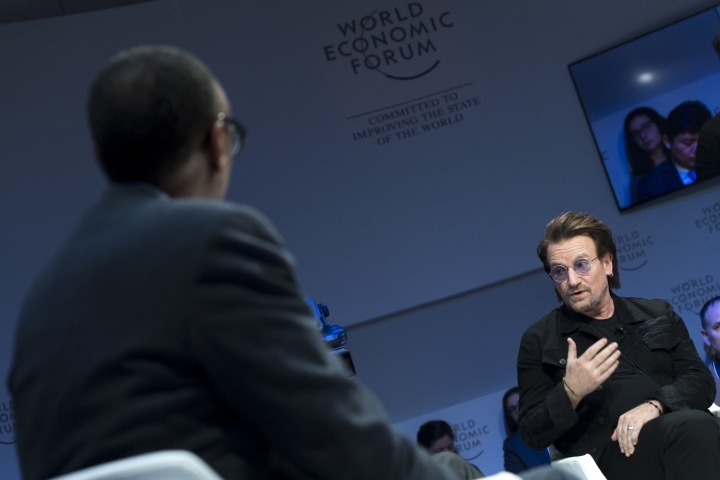 He told The Associated Press in an interview at the World Economic Forum in Davos, Switzerland: "Don't lose patience. We all made mistakes in the past 18 years" — since U.S. forces overthrew a Taliban regime in the aftermath of the Sept. 11, 2001 attacks only to see the fundamentalist Islamic militia regroup in the years afterward. Abdullah also urged Pakistan and other countries that have influence on the Taliban to pressure the insurgent group to negotiate peace with the Afghan government — something it has refused to do. Japanese Prime Minister Shinzo Abe has touted the benefits of two recent "mega deals" in trade. He said Japan, the European Union and the United States must work together to reform the World Trade Organization, notably on rules about government subsidies. Abe's speech at the World Economic Forum in Davos, Switzerland, marked his return to the elite gathering after five years. He referred to the Trans-Pacific Partnership wrapped up next year and the looming entry into force on Feb. 1 of the EU-Japan Economic Partnership agreement. 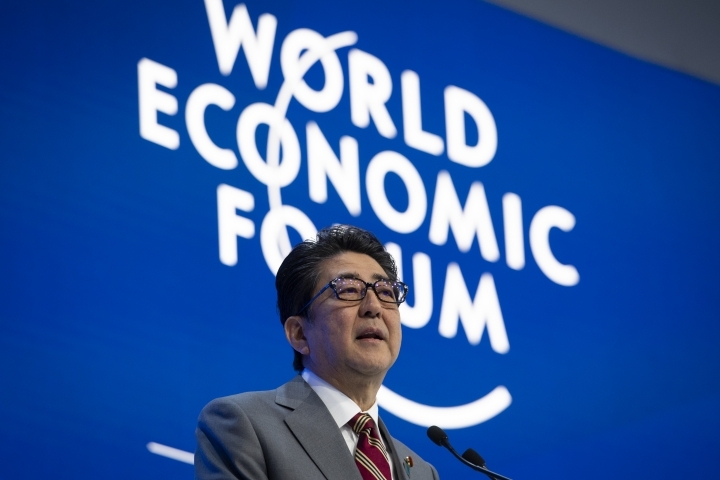 Abe urged a Davos conference hall to "rebuild trust toward the system for international trade." The allusion to government subsidies and call for a trading system that protects intellectual property rights amounted to a reference to China, which the Trump administration has castigated for failing to be transparent on its government subsidies and for swiping intellectual property. 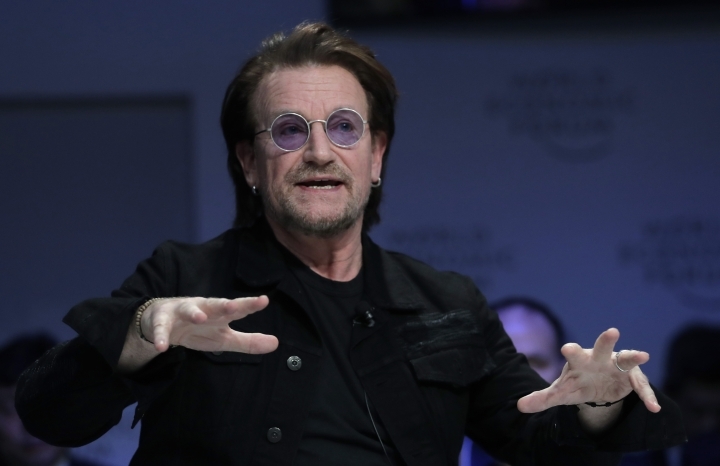 Bono, who has been a prominent campaigner on development issues for decades, says capitalism is not immoral: "It's amoral." 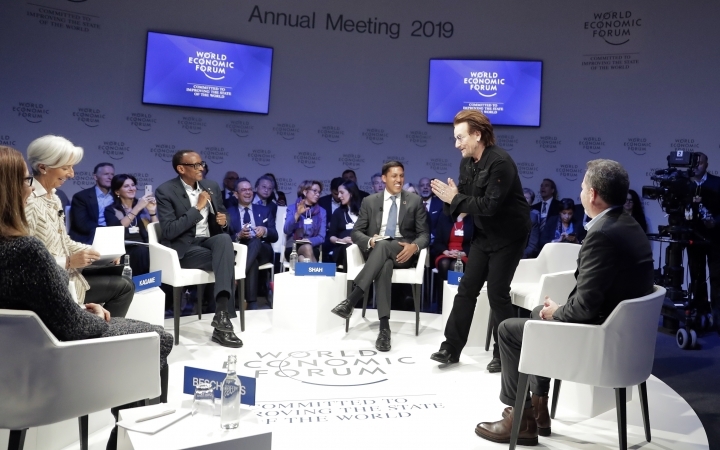 Speaking at the World Economic Forum, the U2 frontman said capitalism has taken more people out of poverty than "any other ism" but that "it is a wild beast and if not tamed it can chew up a lot of people on the way." Those who have not benefited from capitalism are, he said, driving "the politics in our home towards populism." 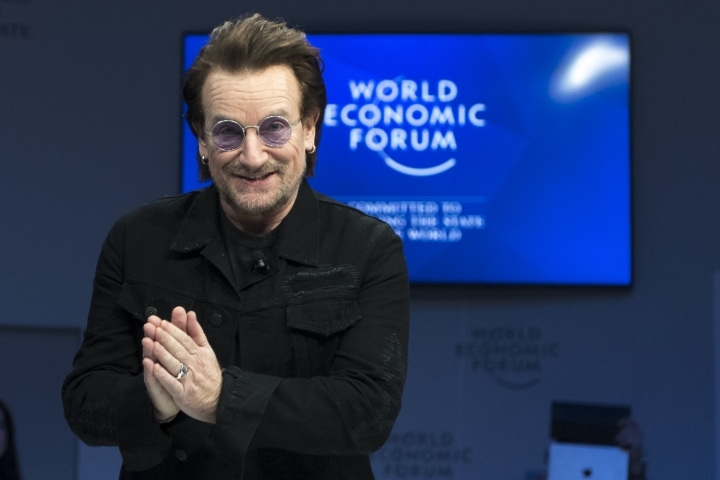 Bono also said that he's had a change of heart with regard to the International Monetary Fund, an institution he once considered to be the "Great Satan" for its "bullying of junior economies." Heaping praise on IMF managing director, Christine Lagarde, Bona said the IMF has changed. The development community, he said, values Lagarde's "tough mindedness" but he added he would still be on her "case." Guido Sandleris, president of the Central Bank of Argentina, says the country is "much better prepared" for the challenge of a slowdown in global trade and the rise in interest rates in major economies, following its recession. 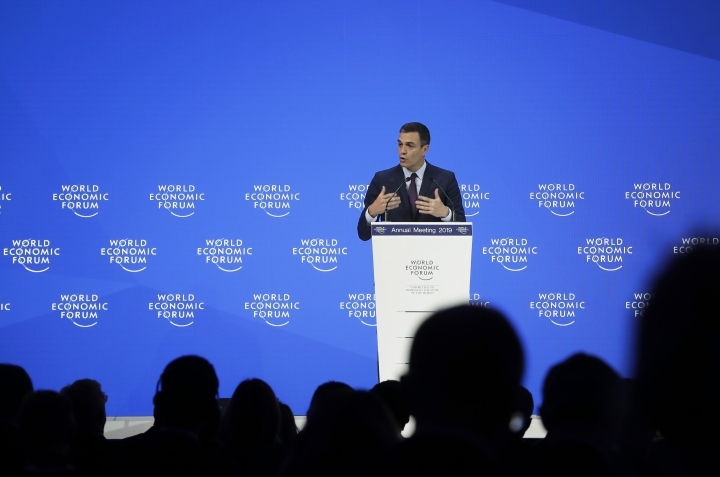 Speaking at the World Economic Forum, Sandleris said Argentina had previously not been strong enough to cope with those twin challenges amid high inflation at home and big fiscal and trade deficits. As a result, President Mauricio Macri negotiated a $56 billion stand-by financing facility with the International Monetary Fund. Though the deficits are heading in the right direction, Sandleris said inflation remains too high. Sandleris defended the government's belt-tightening measures and said protests in the country are more to do with the recession — the economy is expected to shrink further this year — than any anger against the IMF. Hong Kong's Beijing-backed chief executive says she's "quite worried" that the rules-based system that has governed global trade for decades is under threat. Speaking Wednesday at the World Economic Forum at the Swiss ski resort of Davos, Carrie Lam said any diminution in the traditional rules could lead to rising political tensions around the world. She said Hong Kong has prospered "on the basis of free and open trade." Worries over the future of the rules governing global trade have been stoked over the past couple of years, certainly since the election of U.S. President Donald Trump. His administration has taken particular umbrage against China and the two have imposed tariffs on each other that has raised concerns of a full-scale trade war.